Want to pump up the flavor of your next shrimp dish? 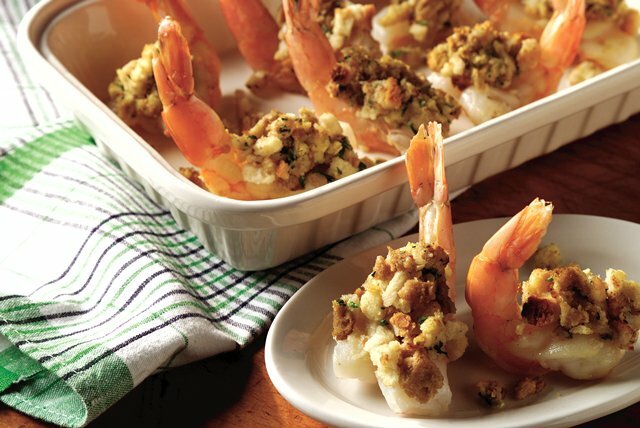 Try jumbo shrimp stuffed with STOVE TOP Stuffing Mix for Chicken! Cut slit in underside of each shrimp. Heat oil in large skillet on medium heat. Add shrimp; cook and stir 5 min. or until shrimp turn pink. Place, slit-sides down, in shallow baking dish. Prepare stuffing as directed on package; spoon onto shrimp. Bake 5 min. or until heated through. The size of a shrimp is indicated by the number per pound, with the smaller number being the larger shrimp. Jumbo shrimp yield less than 15 shrimp per pound.